Infozech’s CEO describes how the company’s easy to use and cost-effective platform incorporates all phases of site management into a single enterprise solution. With a keen focus on an easy to use and cost-effective platform, Infozech has an impressive record of deploying IOT and site management solutions for various telecom infrastructure companies and operators across the globe. Infozech manages over 150,000 tower sites, tracking over 42 million liters of fuel per year, reconciling bills worth US$228 Million, reconciling 7.6 million+ assets. TowerXchange speaks to Infozech’s CEO, Ankur Lal to understand how Infozech solutions are generating value for the telecom industry in terms of revenue assurance, operational efficiency, and cost optimization. TowerXchange: Please introduce Infozech’s site management platform and what parameters it is able to manage and monitor? Ankur Lal, CEO, Infozech: Monitoring tower sites from a centralized location is becoming increasingly difficult with growing networks, increasing OPEX and significant security threats. Poor maintenance of assets and non-visibility on energy consumption only add to the complexity. Profits are getting leaner and SLAs tighter. Infozech’s end-to-end site management solution (iTower) built on a unified platform could be the solution for tower infrastructure companies’ concerns. We have developed an enterprise solution – iTower box for telecom tower infrastructure companies which incorporates complete tower site lifecycle management from site acquisition to decommissioning of the towers. iTower expedites efficient operations, cost optimization and revenue assurance for tower operators and managed service providers. It is a purpose-built solution designed with highly effective field management processes in mind. It unifies the field force by providing a flexible platform for users to collaborate and manage projects from one source while capturing detailed data and real-time site activity. iTower’s data validation layer helps reduce common data errors, omissions that stand in the way of efficient field operations and provides the relevant insights through a dashboard. The primary concerns in streamlining site operation are an asset’s visibility, efficient field operations, security assurance, optimization of energy consumption, accurate invoice generation and well-maintained remote sites. Infozech’s iTower manages and monitors all of these essentials to assist tower operators in achieving operational excellence, reducing OPEX and optimizing CAPEX. TowerXchange: Please explain some of the challenges that tower owners face in collecting revenues from tenants and the role that your platform plays in addressing this. Ankur Lal, CEO, Infozech: For any telecom tower operator to sustain and grow, billing/invoicing has been playing a vital role. It not only helps invoice the customers and collect revenue but also helps maintain a dispute-free relationship with the tenants. Tower operators with billing inefficiencies face possible difficulties such as declining revenue and revenue leakage which directly hits the business and impacts customer delight. < Eliminate all billing errors through data validation algorithms < Build overall efficiency by eliminating recurrence of errors and help improve quality of data in upstream and downstream systems < Support different MSAs and contracts with minimal changes and faster turnaround < Better visibility of the revenue across the region < Provision of historical data for reference purposes during dispute resolution for aged transactions < Standardisation of the billing process across different countries irrespective of different contracts and billing parameters < Efficient and economical Cloud-based modelThrough these functionalities, tower operators can maintain a dispute-free relationship with tenants and prevent revenue losses and leakages.TowerXchange: How is Infozech’s platform helping tower operators in taking a proactive approach to streamlining site operations?Ankur Lal, CEO, Infozech: In today’s market scenario, the complexity of telecom sites and their business models has become critical and has taken its toll on the tower operators by pushing newer technologies and services into their legacy systems. Managing these environments with disparate tools from multiple vendors and technologies makes it extremely tough for tower operators to stay competitive and achieve operational excellence. The result of this increased complexity is higher total cost of ownership, operational inefficiency and degraded customer experience. With this site complexity arises the need for a unified site management tool like iTower with an end-to-end view of the faults at site, performance, and service quality parameters in order to remain agile and competitive. The underlying fundamental to achieve this, is a robust data management strategy that can handle the complexity and variety of site data. (ii) the sanctity of the received data. The biggest challenge is to have a federated view of data and to manage the “single source of truth”. Another issue of increasing concern is missing and incorrect data. Data Validation: Infozech’s platform has been designed in a way that it automatically eliminates the repetitive inflow of the same data, selecting the same value and capturing it. The captured data is verified against permissible ranges and likely values based on business logics. Every raw data packet and its value is validated against its defined type and threshold value to filter out the garbage values, what we term as noise associated with the data. The data discrepancies are highlighted and filled in using the Smoothing Algorithm and Fill-In feature that Infozech has developed. Reconciliation: multiple channels of data coming from machine sensors and the manual data feed from mobile applications are all reconciled and a clean version is achieved. This enables the user to interact with the single version of data, post all the vendor negotiations. Data for grid energy usage is also reconciled with the power bill and a final version is maintained in the system. This verified data now serves the purpose of providing insights on how to plan and make relevant decisions. A unified platform with validated data and an operations data insights dashboard enable tower operators to take a proactive approach to streamline site operations. 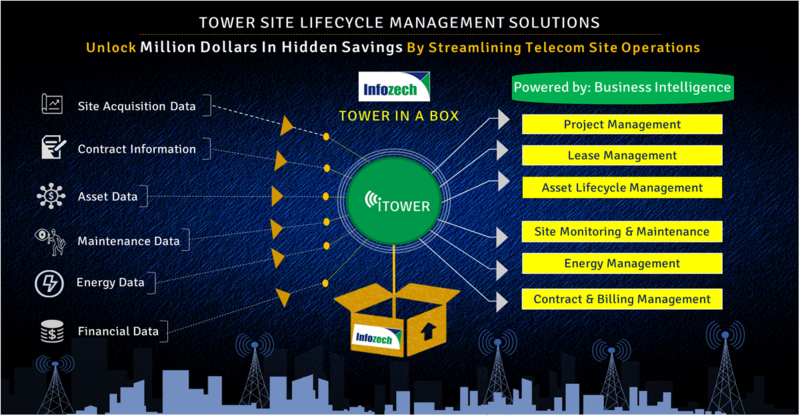 TowerXchange: How does Infozech’s site management platform help tower operators optimise costs? d) Enhanced tracking of spare parts can lead to the removal of unnecessary replacements of non-faulty spare parts. e) Accurate billing data gives better visibility of the revenue across each region. f) Asset warranty, insurance and AMC tracking – Removes excessive repair and replacement expense through granular-level accurate warranty tracking. These enhancements can help tower operators in reducing OPEX by 10-25% depending on the number of tower sites and site configuration. d) Save manual asset audit cost through electronic site audit These asset based insights can help tower operators in the right allocation of CAPEX. TowerXchange: Why should tower owners look to use a complete end-to end site management system such as Infozech’s rather than developing an in-house system? Ankur Lal, CEO, Infozech: Very good question. While looking for site management software solutions, tower operators often analyse the different scenarios to choose between outsourcing and in-house development. This strategic choice may have a significant impact on cost, quality and resource aspects of the telecom tower company. Thus more and more telecom tower companies prefer to choose IT outsourcing models rather than looking for specialists in-house. Subject matter expertise, access to exceptional capabilities and reduced costs are some of the major factors driving the IT outsourcing market. a) Faster approach to high-quality software development resources. b) Flexibility – specialized vendors like us are flexible to provide support in accordance with project schedule and needs. c) Cost Savings – Outsourcing can help achieve a high level of productivity at reduced costs. d) Broader range of subject matter expertise – We have built industry expertise and on-field experience by working with different customers in different geographies and are at a different maturity level. We can actually work as an extended arm. f) Enables focus on core business functions Infozech’s platform and support teams are experienced enough to be key business enablers for tower operators rather than just a cost-saving tool. How Infozech helped one of the telecom operators in mitigating the margin pressures?